A US-based rights group said there had been "a number of rights violations" at a Foxconn factory in China which manufactures products for Amazon. 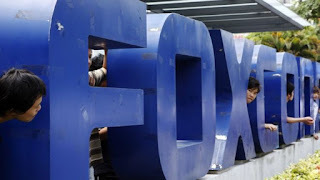 Temporary agency workers were underpaid and overworked at the Hengyang Foxconn factory, according to China Labor Watch. Amazon said in a statement it took the reported violations "extremely seriously". It has asked Foxconn for a "corrective plan" and is monitoring the situation. The report showed so-called dispatch workers were underpaid and made up a far higher percentage of the overall workforce than permitted by Chinese law. The report said dispatch workers were earning 14 remnibi ($2.18, £1.63) per hour and were not paid a higher rate when working overtime. The investigation found that workers put in over 100 hours of overtime a month during peak production season, violating Chinese law which says monthly overtime cannot exceed 36 hours. Dispatch workers, who are not paid sick leave, also made up around 40% of the workforce - far higher than the 10% permitted by Chinese regulation, according to the report. Amazon said it immediately asked for an action plan after identifying "two issues of concern" at the plant in March. "In the case of the Foxconn Hengyang factory, Amazon completed its most recent audit in March 2018 and identified two issues of concern," Amazon said in a statement. "We immediately requested a corrective action plan from Foxconn Hengyang detailing their plan to remediate the issues identified, and we are conducting regular assessments."